The passing of legendary football coach, Joe Paterno was a sad day for Penn State, but that did not stop people from trying to profit financially from his death. Tuesday, the university released more than 10,000 free tickets to Paterno’s memorial service. They were all claimed within seven minutes. Almost immediately, some people started selling the tickets on eBay. Penn state students, staff, faculty, and alumni were outraged. Allison Jendrasek, a senior at Penn State, tweeted, “never been so disgusted in my lif. Listening to students joke about how much $ they’d make selling their JoePa memorial ticket #whatashame.” According to eBay, tickets to free events cannot be sold on its site. However, by Tuesday morning, one ticket received 71 bids, the highest coming in at $99,000. The listing was removed by eBay. A few people still tried to get through the loophole by selling T-shirts for $99 and including tickets with the purchase. They failed. Thanks to the collective effort, at least a half dozen listings were removed. The seller of the $99,000 ticket posted this message: “no one is forcing you to buy tickets; it’s your choice.” The memorial service will be held Thursday at the Bryce Jordan Center on campus and will be aired live on the Big Ten Network and university websites. 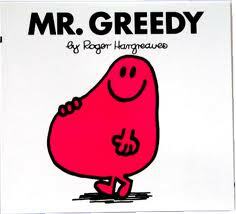 Greed. It’s been a problem since the beginning of time. The last two of the Ten Commandments warns against greed (covetousness). In Luke chapter 12 Jesus tells one of his most chilling parables concerning the greed of a rich man. “I want to share with you a dramatic little story from the gospel as recorded by Saint Luke. It is a story of a man who by all standards of measurement would be considered a highly successful man. And yet Jesus called him a fool. If you will read that parable, you will discover that the central character in the drama is a certain rich man. This man was so rich that his farm yielded tremendous crops. In fact, the crops were so great that he didn’t know what to do. It occurred to him that he had only one alternative and that was to build some new and bigger barns so he could store all of his crops. And then as he thought about this, he said, “Then I’m going to do something after I build my new and bigger barns.” He said, “I’m going to store my goods and my fruit there, and then I’m going to say to my soul, ‘Soul, thou hast much goods, laid up for many years. Take thine ease, eat, drink, and be merry.’” That brother thought that was the end of life. If you think of King only as a civil rights activist, you might be surprised at how much of his message of equality drew on Scripture, and at King’s concern for American moral challenges beyond racial discrimination. He preached another famous sermon in 1958 taken from Paul’s letters entitled “Paul’s Letter to American Christians” , which contained reference to the wealth and covetousness of America. One of the passages he referred to contained the following familiar words of Paul to Timothy. You are prone to judge the success of your profession by the index of your salary and the size of the wheel base on your automobile, rather than the quality of your service to humanity. It was the night of December 30th about five years ago. The temperature was unseasonably warm with a misty rain that was slowly melting the snow. The seven couples that made up our Bible study group had decided to have a progressive dinner. We’d launched the evening with hors d’ourves at one couple’s home then driven to another’s for the salad course. My husband and I were hosting the main course at our home next. I had the dining room table set with the good china and crystal and a ham was in the oven on time bake when we walked in the door. I hustled about lighting all of my decorative candles as the guests were arriving, finishing up with the candle on the foyer table. Our large dog moved about the foyer, joyfully greeting the guests, his big tail wagging back and forth. I was out in the kitchen preparing the food as the last guest arrived when suddenly, the smoke alarm went off. But it was the one upstairs!? Confused, I stepped into the front hall to see thick, black smoke rolling down the hall and up the stairs. In seconds I realized that there were flames in the foyer! They were coming from the artificial floral arrangement on our antique hall table. The dog’s tail had tipped over the lit candle on the table and set the arrangement on fire. In less than five minutes from when it started, the table, the Persian carpet and the wall were aflame! Everyone came running. Two of the men opened the front door and threw the burning arrangement and carpet out into the snow. Meanwhile my husband had run for the fire extinguisher. Within minutes the flames were out. However, it took hours to air the smoke out of the house. The carpet was a loss, the wall and ceiling were charred, and our beautiful wooden antique table was scorched black. It could have been a lot worse, of course. The one thing we all commented about was how very fast a fire spreads! We had no idea. Weeks later, the hall had a fresh coat of paint, I had ordered a new carpet and a carpenter/wood refinisher was standing in my foyer trying to decide if he could salvage the table. He said he would like to try. About three months later, he called with good news. The table had been saved. It didn’t look exactly as it had, but most people cannot tell it was ever burned. Now, honestly, we figured that wood was ready for the dumpster until the skilled restorer worked on it. The ugly was gone. It’s like new now.That’s exactly what the Master Carpenter from Nazareth does with people - people like you and me. We’re all damaged wood. We’ve got layers of dirt and scarring from years of use and getting burned by difficult experiences. But Jesus restores damaged wood. II Corinthians 5:17 says, “If anyone is in Christ, he is a new creation; the old has gone, the new has come!” From the moment you put your life in the hands of Jesus, the Master Restorer, He begins to repair and transform the damage that’s been done by years of sinning and being sinned against. We all carry the damage done from our sinning, from mistreatment, from bad choices, maybe from abuse or addiction or anger. Jesus is a Savior for a person who is tired of the guilt, tired of the pain, tired of the burden - maybe somebody like you. He’s more of a Savior than you could ever imagine. In Isaiah 61: 1-3, He describes the total restoring work He came to do, and that He wants to do for all of us. He said, “The Lord has sent Me to bind up the brokenhearted, to proclaim freedom for the captives and release from darkness for the prisoners, to comfort all who mourn, and provide for those who grieve, to bestow on them a crown of beauty instead of ashes, the oil of gladness instead of mourning, and a garment of praise instead of a spirit of despair” . Now, here is a Savior who wants to turn captivity into freedom and grieving into comfort. The ashes of our life, He wants to turn into beauty, the mourning into gladness, and He wants to turn despair into praise. There is no therapist on earth that can do that, no religion, no self-improvement program. Only the Savior can restore the damage of sin - only Jesus can. Of course, the restoration can sometimes be painful. The carpenter that worked on our charred table said he had to spend days carefully sanding off the soot and burned wood. When Jesus sands off our charred edges, it can be uncomfortable to say the least. Next the carpenter said that he scrubbed the wood to get it clean. 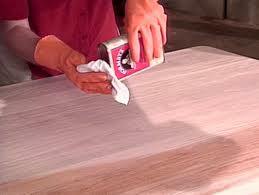 But then he rubbed a rejuvenating oil into the wood, which restored our table’s original gleam. Once we’ve been sanded, Jesus washes us clean and restores us with the oil of gladness. We’ve been salvaged, sanded, washed and oiled through what Jesus did one dark day on an old piece of wood - what one hymn writer described as “the old rugged cross.” The Bible says, “He bore our sins in His body on the tree … by His wounds you have been healed” (1 Peter 2:24 ). He has broken the hold of sin forever - by dying for in our place - for anyone who trusts Him to be their Savior from their sin. It is a new year’s message to the lost and broken. The future doesn’t have to be more of the past. Jesus is waiting right now to begin His restoring miracle if you will open your life to Him. In case you were wondering what happened to the progressive dinner, well we didn’t let a little fire stop us! After opening windows and placing half a dozen fans to clear the house of smoke, everyone bundled up in coats and hats and sat down at the dining room table to enjoy the ham. It tasted especially delicious. We did, however, find ashes floating in our water glasses! HAPPY NEW YEAR from the CONGERS ! December was so chock full of activities this year that this letter had to be postponed, but here it is! As always, the holidays flew by. Our children and grandkids (except Pete and Lindsay) were able to be here for Christmas. The house rocked! (literally!) Let us share with you a recap of 2011 for the Conger clan. January- We traveled out to Pittsburgh to be with Cathy’s family while her father underwent surgery to repair an aortic aneurysm. We thank God that it was a huge success and he has a new lease on life. Cathy stayed 2 weeks to help nurse him back to health. She also tackled an advanced knitting class, making a cabled wool vest and deciding that she should stay in the intermediate class for awhile longer! February- We took a 10 day winter vacation to New England where we spent time on the coast of Maine visiting Cathy’s college roommate and her husband in Saco. We’d never been to the ocean in winter before! Then we drove to New Hampshire’s White Mountains to enjoy the snow and sights, staying at the famous Sugar Hill Inn in Franconia. Check out our vacation photos at www.flickr.com/photos/congerfamily . April – Cathy was commissioned by our church to write a one act play for the Good Friday service. It was about the experiences of Simon of Cyrene and his two sons on the day Simon was forced to carry Jesus’ cross. The actors were magnificent and it was a very moving drama. Spring was late in Wisconsin. We still had some snow for Easter! May- Cathy was excited to attend a 3 day quilt conference in Eau Claire, WI, which featured 3 of her favorite quilting instructor/celebrities. She learned several new techniques and was so excited to concentrate on quilting again that she came home declaring 2012 her “year to quilt”. Rachel’s husband, Mike, earned his doctorate in educational psychology from the U of Minnesota. Congratulations Dr. Mensink! June- We flew to New York City, staying in Times Square while Chuck attended an emergency medicine conference. Fortunately we saw quite a few of the sights (see photos on Flickr site) the first two days because on day 3, as we were about to walk across the Brooklyn Bridge, Cathy fell on a sidewalk and broke her left leg (although she didn’t know it was broken)! She didn’t want to go to the hospital so carried on until we got back to the hotel. The next 3 days she stayed put with ice on her leg. We were able to borrow the hotel’s wheelchair to get across Times Square to see How to Succeed in Business starring Daniel Radcliffe of Harry Potter fame. We also managed a carriage ride through Central Park. The flight home was miserable. After diagnosing a tibial plateau fracture, her orthopedic surgeon put her in a full leg brace with zero weight-bearing for 12 weeks – a long, hot 12 weeks! August- For Chuck’s 62nd birthday, the two of us we went to a lake resort in Elkhart Lake, WI (this place had an elevator) for the weekend. What a beautiful place! (see photos of Flickr site) And Cathy got to swim at last as she was allowed to remove the brace to float in the pool. Heaven! When we got home, we had to drive Laura to O’Hare. She took a leave of absence from her U of Minnesota job to spend August and September in Merv, Turkmenistan on an archeological dig. You might remember that she worked on that dig last summer as well. Her applications are in for graduate school in archeology and we’re keeping our fingers crossed that she will be accepted for fall. In the meantime, she shares a third floor apartment in St.Paul with 2 girlfriends, sings in her church choir, and dog sits Ole, Rachel and Mike’s yellow lab. September- To celebrate getting her brace off, Chuck took Cathy back to Colorado to visit the grandkids since she barely got to play with them in July when her fracture was fresh. Rachel’s husband, Mike, accepted a post-doctoral fellowship position at Northern Illinois U. However, since they had no time to sell their house in St. Paul, MN and Rachel has an excellent job at Como Park Vet Clinic as medical manager, Mike went off to Illinois and Rachel stayed in St. Paul. However, it is only for 1 year and Mike gets home 2 weekends a month. Before he left, they took a second honeymoon to Belgium. Then in October, they went to Oslo, Norway for a conference Mike attended. October- We returned to Pittsburgh to visit Cathy’s family for a week, enjoying the breathtaking, fall color at their mountain retreat. We attended an Octoberfest and took some amazing photos of the colors, which we put into a book for Cathy’s parents for Christmas. Out in Oregon, Peter and Lindsay celebrated their first wedding anniversary with a trip to New England. After a tough time of unemployment, Pete now has a good job in the office of a shipping company and Lindsay is in accounting at a department store chain. Sadly, October also brought sorrow with the tragic death of Lindsay’s father. While Peter has put in his application and has finished night classes to prepare to go back to school for a masters in education at U of Oregon, he says he may have to put it off a year due to the stresses of his father-in-laws death on the family. They are, however, moving to a bigger apartment next month and plan a trip this winter to Mexico. Hallelujah! November-The way we alternate holidays, this was the year that our married kids spent Thanksgiving with their in-laws. Laura flew out to LA for Thanksgiving with college friends and to interview at UCLA. Andrea could not get home either, so when Chuck discovered he was scheduled off for Thanksgiving weekend, we decided to drive to Indiana to have turkey with Andrea and celebrate her 35th birthday. We had not been there (Indiana U at Bloomington) since we helped her move into her apartment last year. We ate out and generally relaxed and had fun together touring the campus. This is her second year of a PhD program in dance anthropology. She’s had numerous opportunities to present academic papers at conferences, teach classes at the university, be a guest choreographer and do research. Now that we have experienced what PhD programs are like with Kim, Mike, Michael and Andrea, we realize how demanding they are – especially the first 2 years. Just imagine- soon there will be five more doctors in the Conger clan! Chuck continues to enjoy his job in the ER in Waupaca, WI, despite the 50 minute commute. He’s looking at retirement in 3 years. This year, one of his job perks was receiving a new I Pad, which he is having way too much fun with! This year’s home project was to clean out the basement and make it useful for storage and recreation. Since April, we’ve cleaned out 35 years of junk (filled a big dumpster! ), had a carpenter come partition it into 2 storage rooms, the furnace room, and Chuck’s workshop. We’ve finished the remaining space as a rec room with a big play area for grandchildren and exercise area for us. Chuck worked hard for 6 weeks painting, carpeting, and wiring to get it ready for the kids at Christmas. Cathy was in charge of organizing and putting everything in plastic bins for storage. She repaired and scrubbed up all the toys we’d saved from our kids plus those she bought on Ebay. The result was all worth it when Katie and Andy went deliriously wild in their new play area! Chuck’s current challenge is recovering from shoulder replacement surgery. You may recall that he had the right shoulder replaced a few years ago. It was so successful that when the arthritis pain in the left became too much, he was eager to go through the procedure once more. The surgery was on January 11th. He will be off work for 10 weeks, the last 2 of which we will spend on a Caribbean cruise! Cathy continues to write, quilt, knit, and do photography. Unfortunately, the broken leg played havoc with her fibromyalgia and Chronic Fatigue Syndrome, necessitating lots of physical therapy and pain management. She’s trying to get her strength back by swimming. If you don’t already do so, check back to this blog periodically to follow her writing and photography. She’s looking forward to a writer’s retreat next month at Green lake, WI ,when she will do nothing but meditate and work on writing projects for a whole week. We are also in the planning stages of a trip out west in May to take Cathy’s parents to see the Grand Canyon, Monument Valley, Pike’s Peak and Bryce Canyon. Speaking of trips, please accept our open invitation to come visit us any time! We know exchanging Christmas cards has become expensive (thank you to all of you who sent us greetings and photos!) but please send us an email. We’d love to know what you’re up to! We all are facing tough financial times, a crucial election, and uncertainty in unfolding global events. Fear and stress can become overwhelming without a solid faith in our mighty God, who knows the future and has it under control. Turn to Him. His line is never busy. We pray that you will have a happy, healthy, and prosperous new year and that, as God is willing, you will stay safe through the storms and find warmth and strength in your loved ones. 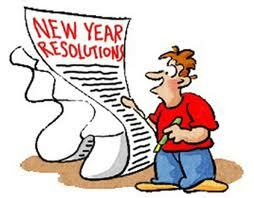 NEW YEARS RESOLUTIONS? BAH HUMBUG! Tomorrow I have a doctor’s appointment. There’s going to be bad news. Not only am I going to have to accept it, I am going to have to do something about it. Before I even see the doctor, I’m going to get this bad news. They’ll call my name from the waiting room and I will immediately go along with the medical assistant to the hallway where, contrary to the HPPA law which says that all my medical information must be private, i.e. concealed from non-medical “others”, I will have to stand on a scale that anyone walking along can read, while the medical assistant reads my weight out loud!!! It’s going to be bad news. But I am not completely without resources to counteract this bad news. I have the power of prayer at my disposal and I have come prepared. I have prayed this prayer -fervently and I’m counting on God to answer it. After all, I read in SELF magazine that you can never have enough money and you can never be too thin. Don’t you judge me. I’ll bet that sometime in the past, you have put a prayer like this out there. You’ve prayed a prayer asking God to change you because you don’t want to be the person you once were and you’re sick and tired of trying to change on your own. In my case, I want to be much less of a person than I am right now - about 30 pounds less. Okay, so I’m just kidding! A little humor in a D-mail can’t hurt. But seriously, don’t you want to be transformed? Don’t you want to be changing into a more Christ-like person in 2012? Then there are the shortcomings that we don’t even recognize in ourselves. Unless we ask God to reveal them, there won’t be a ghost of a chance we’ll be transformed. It’s like my 9th grade school picture. My parents were on me all that year to cut my bangs. I wore them down over my eyes, which was the “cool” style for teens in 1964. I just couldn’t understand why my Dad, in particular, kept ragging on me that he couldn’t see my eyes and therefore I couldn’t possibly be able to see properly. They even laughed at my school picture! Well, I wasn’t laughing. I thought I looked supercool - that is until I was a senior. As a senior I could see how ridiculous and immature I had been in 9th grade. That photo represented who I had been but no longer was. That’s the miracle of being a new creation in Jesus Christ. He promises to transform us into a far better person - even when we cannot see any need for improvement. “So here’s what I want you to do, God helping you: Take your everyday, ordinary life -your sleeping, eating, going-to-work, and walking-around life- and place it before God as an offering. Embracing what God does for you is the best thing you can do for him. Fix your attention on God. You’ll be changed from the inside out.” The Message translation I think I’ve found my verse for 2012! No matter what your New Year’s resolution(s) is, I charge you to get into God’s word and find out how he can help. I wish you success in Jesus’ name, my friends. I hope you will pray for me as well. Mary and Joseph stayed in Bethlehem many months after the birth of Jesus, yet we know nothing about that time. Knowing that one day she would have to submit to him as her Lord, I wonder how she treated her baby? How much attention were they getting from the townspeople? What were they telling people, if anything? We simply don’t know. But we do know that one day some travelers from the east-maybe Persia or Mesopotamia (the regions of modern day Iran or Iraq)-suddenly showed up in Bethlehem, claiming to have been guided to a new king by a star. The word Magi refers to people who belonged to a priestly caste that focused on special knowledge, interpretation of dreams, and astrology. Despite popular depictions, they were not kings; we don’t know their names, and we don’t know for certain that there were three of them (that is a tradition inferred from the fact that they bore three gifts: gold, incense, and myrrh). There may have been two; there may have been twelve. But what we do know of them is startling. They saw an astronomical sign. They were motivated. They traveled a very great distance. 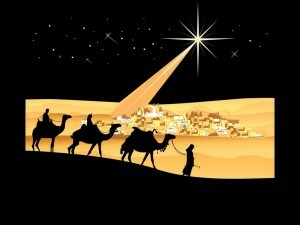 No wonder they are sometimes called “wise men.” They were not merely astrologers. They were worshippers. Jerusalem was their first stop, where they inquired about a new king (a sure way to alarm a jealous, existing king); but then they found Bethlehem. They delivered their valuable gifts, and they bowed in worship. If people in Bethlehem weren’t paying much attention in the months following the birth of Jesus, they surely were now. Last year I did a re-telling of the story of the birth of Jesus from the point of view of Joseph and Mary and published it in book form. I wrote what I thought they would have told their son, Jesus, when, at age 11, he asked to hear the story of his birth. Here is the segment from the book concerning the visit from the Magi as told to Jesus by Joseph. `Three what? !’ she called from the sleeping room. `My masters are Magi from the great land of the Parthians in Persia. They are Zoroastrians and have spent their many years studying the movements of the heavenly bodies. The star under which the child was born is most unusual. According to the ancient writings, it seems that this star is the sign that a new king has been born to the Jews. If you would be so kind, my masters desire to see this child and present him with gifts worthy of his royal birth. Jesus, you wouldn’t believe the wealth! Never had I seen such grandeur. A dozen servants came with fine rugs and cushions that covered the whole floor. Then they brought in bowls of fruit and meats, jars of honey and wine. It was more of a feast than we had ever seen in our lives! Then the three Magi entered. They were magnificent! When Mama brought you to them, they prostrated themselves on our floor, worshipping you! And what is even more miraculous, you seemed to know it, even though you were just a toddler. Since we did not speak their language, a servant sat next to us and translated what the first magi said. “Really?” Jesus asked, his eyes as big as saucers. “Oh, no, Jesus. I’m afraid they are gone. The gifts were magnificent though. One gave you frankincense, the finest incense used in worship. The second gave you myrrh, precious oil for beauty and anointing. The last gave you gold, a most generous amount, fit for a king. We really felt awkward receiving these gifts, but the Magi said they were for you and that we were to manage them for your benefit. How could we refuse? Then we ate! The food was like angel’s fruit from heaven. So fancy! Your mother even gave you a few tidbits to chew on. `King Herod was filled with the spirit of Satan, wasn’t he, Papa?’ Jesus’ young face flashed in anger. “Jesus, do you remember the words the prophet, Jeremiah wrote? We were later told that because the magi suspected that Herod was up to no good, they did not re-visit him, but instead, returned to their land by another route than Jerusalem. “We lived as nomads there for several years. We were afraid Herod might have had us followed so we moved to a new place every few weeks. The Magi’s gifts sustained us for those years. It was a difficult life and your mother grieved for what her family must have been going through. Indeed, your grandfather and several other of our relatives died while we were away. Joseph pulled Jesus into his strong arms and held him tightly. What was Almighty God going to do with this lad, His son? Joseph prayed for strength and for wisdom. Though foreign to this land, Jesus was of keen interest to these Magi. This stories remind us that we can often overlook the miracles taking place in our own neighborhoods. If we are not careful, the celebration of Christmas can become so familiar to us, that we let it come and go without taking time to truly contemplate the miracles and blessing we celebrate each season. Men from far east went out of their way to find Christ and to set treasures before him: would it take strangers to remind us too of the blessings in our midst? One of the best things we can do in this retail-obsessed Christmas season is to bring the gift of worship to him. Lord, I know that what you want me to give you is my life. Help me with my motivation and willingness to go the distance. Show me what gifts I can bring you.